Home » WI-060. 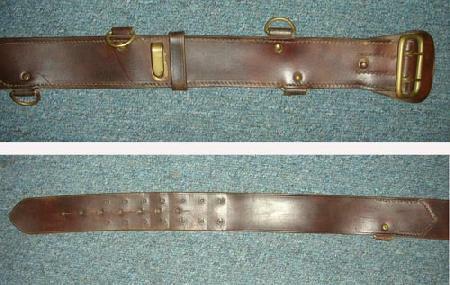 WWI Allied Officers Sam Brown Belt. WI-060. WWI Allied Officers Sam Brown Belt. Unmarked example so you cant tell if its French, British, Belgium, U.S. etc. as these were standard for all officers. Brown leather with white stitching. Huge size (will fit up to a 50 waist!). Appears that some rotund officer had this custom made by adding a longer back piece. Well done, looks period. VG condition. Has D rings but no cross strap.